New York – QSX Instruments Inc is pleased to introduce a new solution for RoHS testing needs through its Quickshot XRF analyzer line. The new bench-top system (QSX-82D) was developed specifically for organizations that require the ability to test small electronic components for RoHS compliance. The marketer and distributor of x-ray fluorescence technology had a strong year in 2010 with its primary clients adding XRF for precious metal analysis and hazardous substance detection for CPSIA regulation interests. However, the only system available for detection of lead, cadmium, mercury and other hazardous substances was a Handheld XRF analyzer (QSX-HH). It grew in popularity for consumer goods testing because of its relatively low-cost and portability; however, QSX Instruments realized the need for spot analysis of electronic components and offers a solution with the release of the QSX-82D. Features of the QSX-82D analyzer include the efficient Silicon-PIN (Si-PIN) detection system, which enables the system to meet the speed and detection limits required by organizations with in-house RoHS testing needs while also offering a relatively cost-efficient solution. Multiple filters and collimators are included, as well as a color camera system with cross-hair visuals for alignment of small target areas; including solder joints. Prior to the release of the desktop system, organizations that had an interest in having in-house testing to insure a product line was compliant to RoHS regulations would only have the Quickshot XRF handheld system as an option. Although the portable analyzer is a top performer, manufacturers and importers of semiconductors, capacitors and other small electronic components would request a color camera system and increased report functionality – the QSX-82D provides both. With a direct connection to a desktop (or optional laptop) the instrument provides a simple to navigate software package that includes report generation functionality that will aid in the data storage needs of quality control departments. QSX Instruments is a growing marketer and distributor of x-ray fluorescence technology. In addition to hazardous substance detection in consumer goods (per CPSIA and Prop-65), the Handheld XRF analyzer offers a solution for a number of testing needs – including geological analysis and gold testing. Desktop systems are available for precious metal assay and, with the release of the QSX-82D, for RoHS compliance needs. 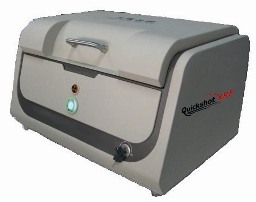 Visit www.quickshotxrf.com for details on the organization, available analyzers and EDXRF Technology overviews.